The closure used on a bottle can say something about a bottle's age. Regional preferences and traditions help to dictate what closures were popular and for how long. Patented stoppers can be no earlier than the submission and most were not used for very many years. By far the most common closure used on beer bottles until about 1880 when the Lightning stopper became standard. Initially, a string or wire was used to secure the cork to the bottle. Later, a wire bail became the standard. Some bottlers still used corks into the Twentieth Century, usually on export shaped bottles. Corks for beer bottles were about one inch long. Example shows string used to retain a cork in the bottle. This cork fastener was the standard used on corked beer bottles during the1860s and 1870s when it was replaced with the Lightning stopper. The bail was reusable and the bottler was not required to rewire the cork with every refilling of the bottle. This stopper enjoyed moderate success, but was more popular in some areas of than in others. It consisted of a disk, made of a flexible material, that was inserted into a thin groove in the lip of the bottle. It was replaced by Painter's more popular crown cork stopper. This stopper did not enjoy immediate success. It consisted of a metal cap that had a crimpled edge that when compressed secured the cap to a specially designed lip. A cork liner prevented contamination of the contents from the metal cap. By Prohibition, it was the standard as it was easily adapted to automated bottling lines. An early stopper that consisted of a hollow soft rubber ball that was pulled into the neck of the bottle. 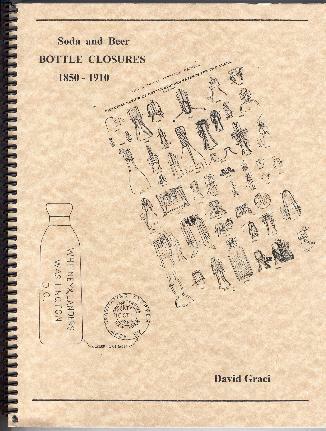 The patent was assigned to the Automatic Bottle Closing Company of New Haven, Connecticut and all known bottles bear the "A. B. C. Co." embossing. These bottles are distinctive in shape and are also marked with the patent date. A number of different bottlers experimented with this closure, but none adopted it. This closure was a basically flipped over the top of the bottle and snapped on to the tie wire on the neck. This closure was initially used on glass weiss beer bottles on the East coast, close to its inventors home in New Haven, Connecticut. However, it was used much later to about 1890 on pottery beer bottles from Wisconsin. This was a form of cork fastener, with a modification by John Matthews that used a rubber and metal stopper. These were used on lager beer bottles. It was used only in the metro New York and Philadelphia areas. Bottles usually have the Matthews name and the patent date embossed on the base and can be identified by the unique bulge in the neck just below the lip. It was replaced by the Lightning stopper. This closure was perfected over nearly ten years by Frederick Schlich of New York City. The stopper consisted of a metal stopper with a rubber covering that was forced into the mouth of the bottle. Although Schlich's patent preceded the Lightning stopper by ten years, without a cam, it could not compete and did not achieve market success. This closure was a variation of the Lightning closure with the difference that the eccentric was mounted in a glass dimple in the lip instead of on a mounting wire. The patent deals with filling these bottles, but also identifies this new configuration of the eccentric. This was used mainly on pottery ginger beer bottles of later vintage. This closure was marketed by the Champion Stopper Manufacturing Company of Greenfield, Massachusetts. The stopper was based on earlier patents and closed by tightened by pressing the lever tight. This closure was another English import that never became successful. Riley improved the inside screw stopper by adding a protrusion to the top of the stopper that allowed for easier opening. This closure was a variation of bailed closures. The stopper was attached to the bail via a loop on it. This stopper was only used on beer bottles. Bottles that used this closure are identified by the unique "L" shaped indentations on the lip of the bottle. The closure consists of a sheet metal bail whose eccentric slid into the groove in the lip. The patent was assigned to the Facile Bottle Stopper Company of New York, New York, which is marked on some of the bottles. The patent drawing shows a square mark on the base of the bottle, which is present on some of the known examples, but is not explained by the patent.. This stopper was mainly used in the metro Baltimore area and was a competitor to William Painter's Bottle Seal closure. However, unlike the Bottle Seal there were two sizes as seen on some of quart sized bottles. The groove on the inside of the lip is very close to the top and is not as angular as the Bottle Seal. Painter successfully sued Hall in 1903 and won. This stopper was an improvement on the Lightning closure with a wire bail and eccentric. The difference is that there were two loops on the side of the stopper that accepted the eccentric. One Boston bottler had his name impressed on the top of the closure. The closure appears to have had more success in the New England market as Thatcher was from Providence Rhode Island. This stopper was only used in the metro Baltimore and Philadelphia areas and was replaced by the crown cork seal closure. Most of the bottles were used by the Gottlieb Bauerschmidt Straus Brewing Company of Baltimore. It appears to have been used experimentally by the few bottles. Some of the bottles are marked Universal Seal & Stopper Co. of Baltimore on the base and all have a large tapered groove in the lip, which often flares out, with a small ledge at its base. This stopper of a metal cap that was secured to a specially formed lip on the bottle, which is an exaggerated square collar. This closure found some success at Midwestern breweries. This stopper was a slight deviation from the Hutter closure. Instead of the inverted cone shaped porcelain stopper of Hutter, this one has a rounded top. This was an accommodation for Strebel's bottling machine patented number 723,065 on March 17, 1903. According to the patent, the stopper was meant for carbonated beverages or for use on bottles that used the Hutter stopper. The stopper was advertised as the "Globe" and together with his bottling machine were advertised as late as 1915. The following closures were used to seal beer bottles, but never achieved and level of success or market penetration. They occur on from 1 to 5 bottles. Some were only used by the inventor. An early closure that was used to empty and reseal bottles. It was described as a faucet that was controlled by a screw on cap to empty the contents. Although described as a closure for mineral water bottles, the only known bottle is a pottery mead bottle. These bottles are identical in shape to the standard mead bottles with a ledge in the neck of the bottle, as reflected in the patent drawings. Munson Cronk, the inventor, was the sole user. This closure consisted of a glass stopper that screwed into the lip of the bottle, which had matching threads. The stopper only occurs on one beer bottle, but enjoyed considerably more success on whiskey bottles. This closure a bail with a cast top. The stopper only occurs on one Castner beer bottle from Changewater, NJ. This patent was the first in a long series of levered or pump handled stoppers. William Vom Hofe of New York City was issued his first patent of this design in May of 1875 and quickly followed it up with improvements that manifested in his August 1875 patent. It is unlikely many of the earlier patent design made it past the prototype stage. There were a number of very similar pump handled patents of similar style that were patented over the next twenty-five years and caution should be used before attributing this patent to a specific closure. This patent was awarded to Wallace H. Bate of Norwood, Massachusetts. The approach was to use a cam lever, secured under the lip by a wire, that would force the rubber lined stopper into the mouth of the bottle. This would have been an early competitor to the Lightning stopper, patented a mere 8 months prior. Part of the rights to this patent were assigned to Mathias Radermacher of Boston, who appears to be the sole user of this stopper. This patent was applied for nearly a year before it was issue to William Whitman of Chicago, Illinois. The stopper consisted of a metal stopper with a rubber covering that was forced into the mouth of the bottle by a lever that resembles a pump handle. Part of the rights to this patent were assigned to John A. Lomax, the major bottler in Chicago, and a Martin I. Whitman, also of the same place. This stopper never met with much success, but should be found on other Upper Midwestern bottles. This patent was one of many issued in the second half of the 1870s that were based on some sort of cam lever that would pressure the stopper into the mouth of the bottle. These were to compete with the Lightning Stopper, patented in 1875and dominating the marketplace. This stopper is only known on one one bottle used by G. W. & C. R. Miller of Boston. Graci attributes this stopper to the James T. Walker of Troy, NY and his April 14, 1885 patent number 315,576. The Millers were listed in the 1876 thru 1885 Boston Directories. Since the business ended the same year of Walker's patent and the patent drawings of Smith's stopper more closely match the Miller bottle. I am attributing it to the ealier patent. Needless to say this patent did not meet with much success. This patents was issued to Henry W. Putnam of Bennington, Vermont and appears to have some success. This patent was quickly improved upon by to a later patent in 1880. The stopper consisted of a removable metal stopper with a rubber covering that was forced into the mouth of the bottle using the typical wire bail. The stopper was to be used in conjunction with a bottling machine that forced the detached stopper into the mouth of the bottle after it was filed with the beverage. The stopper was hampered by the fact the the stopper could easily be lost as it was not secured. The later improvement added a clip to solve this problem. This patent was an improvement to earlier patents issues to Henry W. Putnam of Bennington, Vermont and appears to have seen some commercial use. The stopper consisted of a removable metal stopper with a rubber covering that was forced into the mouth of the bottle using the typical wire bail. The stopper was to be used in conjunction with a bottling machine that forced the detached stopper into the mouth of the bottle after it was filed with the beverage. The stopper was then secured by snapping the bail in place. This stopper met with some level of success, but was hampered by the need to invest in a bottling machine in addition to a supply of stoppers, but solved the problem of the earlier stopper. This closure is a variation, in principle, of the Lightning stopper. This closure can be identified by its large rectangular openings on the plug where the eccentrics attached. The only known application was on a beer bottle used by John A. Darlington of Brooklyn, New York and this was well over a decade after patented. The later Thatcher 1901 patent may have been based on this design. This was previously known as the Darlington and Gross closure. The patent was patented by Max Rubin of Philadelphia, Pennsylvania. The stopper involved a cap that drawn down onto the lip of the bottle by a twisting action. The stopper is found on a bottled from the Albany area. The patent for this closure was assigned to Woods, Sherwood & Company of Lowell, Massachusetts. The stopper was based on the Lightning closure with a stopper that tightened to the bottle as it was twisted. The stopper is found on on a bottle marked "The Lowell Bottle Stopper." This closure was a variation of bailed closures. It consists of a cam that when depressed forces the stopper into the mouth of the bottle. The tab on the cam come in two different configurations. This stopper was only used on beer bottles. This closure was a variation of bailed closures. This was William Painter's first bottle closure patent. He would be much more successful on his later Bottle Seal and Crown Cork closures. This stopper was only used on beer bottles. This closure was only used by several bottles of beer. The bottles can be identified by the the tight threads that received a metal stoppers that screwed into the lip. The stopper was secured to the bottle by a loose fitting bail that was fitted to the neck. This closure was only used by New Jersey beer bottler. The bottles can be identified by two glass lugs on the neck that held a metal bands and the lack of any definable lip. The stopper was secured to the bottle by a loose fitting bail that was fitted to the neck. This closure occurs on one bottle from Northwestern Pennsylvania. It was based on Vom Hofe's 1875 patents and was marketed by the Keystone Stopper Company of Pittsburgh, PA. The pump-like lever of the 1875 patent was replaced by a smaller triangular thumb lever. Keystone was sued by Henry Putnum in 1889 for infringement on the lightning stopper patents awarded Charles De Quillfeldt in 1875 and reissued in 1877. Putnam proved Vom Hofe's patents were an infringement on the tenants of the Charles De Quillfeldt patents. Keystone lost the case and was dissolved in 1890. This stopper was consists of a wire bail with a stopper on it that flips over the bottle's lip. The cam is a flat molded piece of metal that forces the closure into the opening of the bottle. This stopper was used by a few bottlers in the Scranton area, where Bloeser was associated with a local glass house. This stopper was consists of a wire bail with a stopper on it that flips over the bottle's lip and a clip secures the stopper by snapping under the lip. The lips on these bottles are oversized tapers that have a unique shape to support the closure. This stopper was used by two Philadelphia bottlers. Another English import, this stopper was never popular in the United States, however it was widely accepted in England and its colonies. A composite stopper was screwed into the lip of the bottle, which had screw threads on the inside. The stopper was marketed by the American Screw Stopper Company, Limited, in Jersey City, which only advertised in 1891and only appears to have been used by firms in Northern New Jersey. This stopper was consists of a wire bail with a rubber capped porcelain stopper on it that flips over the bottle's lip. A loop engaged one end of the stopper and drew the stopper against the lip as its cam lever was tightened. This was an improvement on Siemens' earlier patent 58, 602. The lips on these bottles are of a double rounded collar design with the fastening wire in the groove between the two. Although popular in Europe, this closure had very limited use in North America. This closure is a variation of the Hutter porcelain stopper, which was patented in 1893. Dreyfuss claimed that the arrangement of the stopper head significantly reduced the wear on the rubber gasket that sealed the bottle. The stopper was marketed by the Dreyfuss Bottle & Stopper Company of New York City; Dreyfuss' home. A sample or marketing model exists for this patented closure. This closure is a variation of the lightning stopper. Manning claimed his stopper was of an "improved character." Manning was a bottler in Waverly, New York and used the stopper on his bottles. Due to the more complex nature of the stopper, and with no clear advantages. It is doubtful any other bottlers adopted Manning's stopper. This closure is a variation of the lightning stopper. The purported advantage was the fact that the stopper would open more freely than the typical Lightning closure. Cunningham was a member of the Cunningham Supply Company, which supplied bottlers. This stopper was consists of a wire bail with an eccentric that inserts into the lip. Only a Camden and Philadelphia bottler appears to have adopted this closure. With the third bottle being a salesman's sample. The lips on these bottles are exaggerated to accept the closure. The closure appears to have had more success on fruit jars with the Alston label. This closure is basically a lightning stopper, but what distinguishes it is that the stopper itself is glass and not the typical metal or porcelain. The stoppers are known in amber and clear glass and in both cases the stopper matches the color of the bottle. This stopper of a metal cap that was secured to a flared lip on the bottle. This was a deviation of William Painter's Crown Cork. Painter sued Abbott in 1903 and won. Although this stopper occurs on two bottles, it may not have been commercially produced. This stopper consisted of a metallic disk that was attached to an elastic sealing material. The disk locked into grooves in side the lip of the bottle or jar. This was a deviation of William Painter's loop seal. A firm called the Inter-Seal Company was organized to market this closure in 1904, but is was defunct by 1906 . Although this stopper occurs on a sample bottle, it may not have been commercially produced. When he cut his hand while trying to open an ginger ale bottle, George Williams vowed to invent a better closure. He got his idea in 1901 and continued to refine it as a pass time. He patented it in 1906, organized the Williams Sealing Corp. on October 19, 1909, refined the machinery to make the closure, and sold them commercially starting in 1911. An initial reseller was the Illinois Glass Company in 1911 as illustrated in their catalogue of that year. The initial factory was located in Waterbury, CN, but a factory was later opened in Decatur. IL, to be closer to the customers. The closure became popular as a resealing device on crown top beer bottles and was being used during the Second World War. It was used as a primary closure on medicine and cosmetic bottles. The inventor claimed that his new closure did not cause distortions in the neck of the bottle and better facilitated cleaning and filling. McDonnell claims to be a "practical bottler and glass manufacturer" and owned the Scranton Glass Company of Scranton, PA; a glass jobber. In 1910, McDonnell trade marked his closure "Santitop."